alaTest ha raccolto ed analizzato 20 recensioni su HTC Shadow Smartphone. La media della valutazione per questo prodotto è 3.2/5, confrontata con la media della valutazione di 4.3/5 per altri Cellulari. Le persone sono impressionate da fotocamera e schermo. In aggiunta, prezzo e design ottengono un buon feedback, tuttavia alcuni utenti hanno dubbi circa la performance. Abbiamo analizzato differenti valutazioni di esperti ed utenti, età del prodotto ed altri elementi. A confronto con altri Cellulari, HTC Shadow Smartphone ha ottenuto un alaScore™ complessivo di 81/100 = qualità Molto buono. The T-Mobile Shadow features some significant upgrades for 2009, but they're not enough to match the competition. Attractive. Free calls via UMA-based Wi-Fi. Seamless handoffs between regular cellular and Wi-Fi calls. Comfy hybrid QWERTY keyboard. Poor Web browsing and video playback. Some UI-related snafus. Useless video-recording mode. The HTC Shadow is a new Windows Mobile 6 based smart phone for T-mobile service. It has a lot of potential and after spending some time with it, I really appreciate the amount of work that HTC puts into its phones. The call quality of the Shadow could be better, particularly the speakerphone. The navigation wheel is slippery, and performance can be sluggish when numerous apps are in use. If you're looking for a smartphone in a sleek disguise, Shadow is an interesting choice. 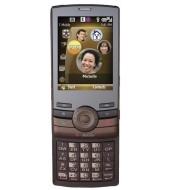 Though it runs Windows Mobile, it's really more like a souped-up messaging phone than a smartphone. The custom UI is a great touch. I don't know who the manufacturer is, a name I havn't heard of. When the contract is over, I am going back to the Sony or Samsung. Very fancy. Very much looks like a MP3 player other than a cell phone. Many features. I own this phone for about 5 months now. begined around 3 months, if you don't charge it every night, the battery won't survive next day, even you don't use it at all!